Orphanage Park is tucked behind Tabor Christian College on Goodwood Road. 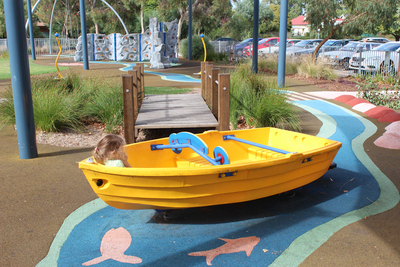 The playground is small, but it's spread out, with a rubber 'river' running through the whole playground and bringing the whole theme together. The play space is surrounded by an oval and a grassy field, so there's plenty of extra space to run around or kick a ball. 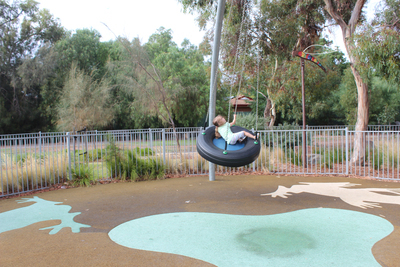 The highlight of the playground is the huge tyre swing, it's big enough to fit 3-4 kids at a time, and with a bit of momentum can go quite high and fast. The whole playground is fenced but the tyre swing has it's own fenced area, which is a good way of stopping kids accidentally getting caught in it's path. One of the other highlights is the mini rock climbing wall. It has varying heights so that kids can progress along it as they get more confident. 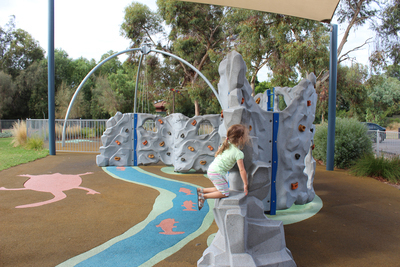 Most playground climbing walls are only big enough for one or two kids, but there's plenty of room on this one. 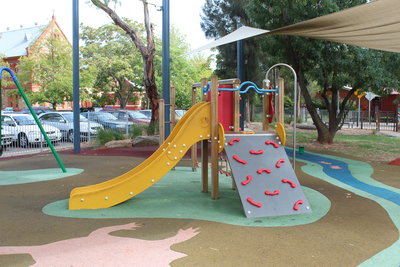 The main play equipment is actually really small, which means that it's great for younger kids as well. With the extras like the climbing wall and the tyre swing, it's not really a downside. There's a small slide, a few climbing frames, and some regular swings. The boat along the 'river' is also pretty popular. 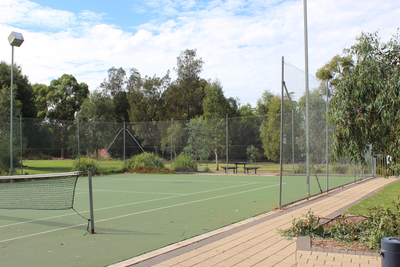 For older kids there's a tennis court that opens up to the playground, and outside of the fenced area there's a basketball hoop. They can keep entertained while younger kids play. 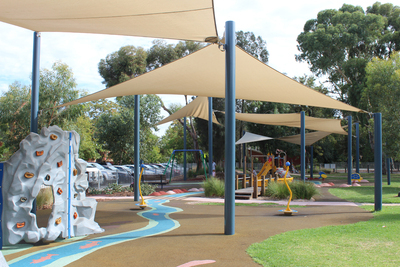 The playground has picnic tables, toilets, and water fountains. The swings need an 'arc' of strong surrounding mesh to protect passer-by toddlers. On our visit we witnessed no less than 3 little children being knocked to the groundhit. Luckily, no serious injuries with any of these children on the day but this is strong indication of prompt attention by those involved with this Park's administration team.